Fall has long been underway and there is even snow in the forecast in some states! But just because we're entering the winter months doesn't mean we can't still appreciate the memories of summer and even keep them alive! There are a few ways to do that! 1) You can actually go somewhere tropical and sunny! Think Balize, Jamaica, St. Thomas! 2) You can buy a sun lamp and bask under the glow! 3) You can wear Del Sol color changing clothing and realize that the sun is still up there somewhere, and its rays are making your clothing burst with color! Welcome To The 'Sunny Summer Memories' Giveaway, where one person will receive $100 to Del Sol, home of color-changing clothing and accessories! Del Sol uses dye with Spectrachrome Crystals, which when put onto fabrics, plastics or even in liquids like nail lacquer, and in turn exposed to sunlight, become visible to the human eye! 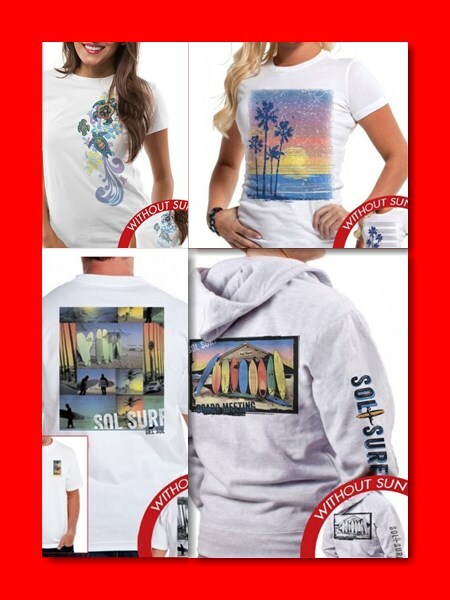 Del Sol Apparel and Accessories turn brighter and more colorful when you go outside! Summer memories are really only a step away! Del Sol also has a full line of Disney apparel, a Marvel Comic line with Thor, Spider Man, Captain America and more, nail polish that is non-toxic and cruelty free and their Solize line of polarized,100% UVA and UVB protected sunglasses! Look for daily deals and giveaways on their website and social media sites as well! Discount Code: Take 20% off all purchases (including sale items) when you enter AGalNeedsSun at checkout! Free shipping on all orders $35 and over! 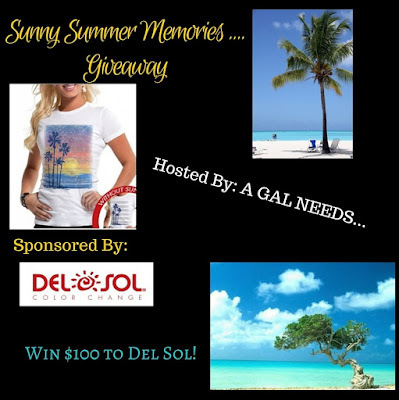 Giveaway: One winner will receive a $100 eGift Code to Del Sol! Open to U.S. only, age 21+, and one entrant per household. All entries are optional! Remember the more entries you complete, the better your chances are for winning! This is a Rafflecopter Giveaway. Winner will be selected through random draw! Also, many thanks to the great bloggers who are participating in this giveaway! Please consider liking all participating bloggers on Facebook. They worked hard to bring you this giveaway and others like it! Don't miss out on any future events! Sponsor is responsible for delivery of prizes, not participating bloggers. This blog received no compensation for the facilitation of this giveaway. Enter the giveawy in the Rafflecopter below! Giveaway runs from 11/2/15 - 11/18/15. Good luck!